Collie Broadsheet: Stereo Aids - Manufacturers of Mirror and Pocket Stereoscopes. Publishers of 3D Imagery. A3 colour Landsat TM image 1:250,000 size showing the Collie-Bunbury region. 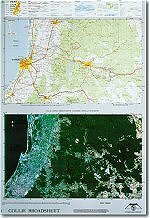 A3 topographic map 1:250,000 size covering the same area as the map. 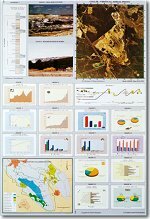 14 original colour graphs (pie, area, line, vertical & horizontal columns, 3D columns) to show various aspects of Collie coal mining and the impact on the environment. 2 ground photos to show open cut mining and dump rehabilitation. 2 diagrams of coal seams and coal mining processes.